I was going to wait until Friday to mention this, but this is a ‘stop the presses’ sort of situation, so I re-arranged the previously scheduled programming to bring you this beauty innovation–stat. I have waxed poetic on many occasions about my love of Tarte’s cheek stains, they are hands down the fastest way to get ‘insta-pretty’. 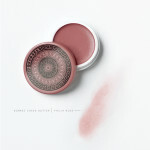 I feel like blush is neglected in most beauty regime’s or applied so horribly that you wished that it was opted out. My mom used to use a tube of red lipstick on her cheeks; after expertly blending it in it always imparted a perfect rosy glow on her tawny cheeks (try it in a pinch it works really well). I have to be so careful on how I apply blush as I have hyper-pigmentation on my cheeks and I don’t want it to look like I have a dusting of dirt on the apples (which can happen if I ever dared use a badly chosen powder formulation). 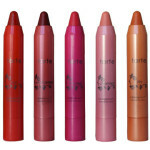 I know that the Tarte stains are very natural looking and I don’t look like I have streaks of cosmetics on my skin (which is a beauty ‘don’t). You don’t want your blush to sit on top of your complexion, but rather blend perfectly so it looks like you have a beautiful natural flush. I have had one problem with the stains, they don’t work with any mineral foundation, in fact, I couldn’t find a blush that did. I have very dry skin, so mineral make-up wouldn’t seem like an ideal choice, but it’s actually the one make-up that covers my hyper-pigmentation really well without it looking like I have a ton of make-up on (key for any cosmetic is a very gentle hand during application and to layer it on). 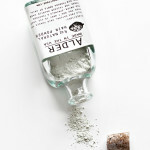 For those that are interested, I prefer finely milled mineral foundation–Laura Mercier and Korres are some of my faves. I was at Ulta the other day picking up my fave splurge moisturizer and saw that Tarte had come out with a new blush, every single piece was sold-out except for one color, it seemed to me a good sign (or a good shop-lifter). I picked up a tester in the one color that was left, it was not what I am used to or what I preach here, the color looked in the sample compact a little dark + dusty/flat and it had some shimmer (I am not a fan of shimmer), but I tried it on and wondered if the lighting was off. 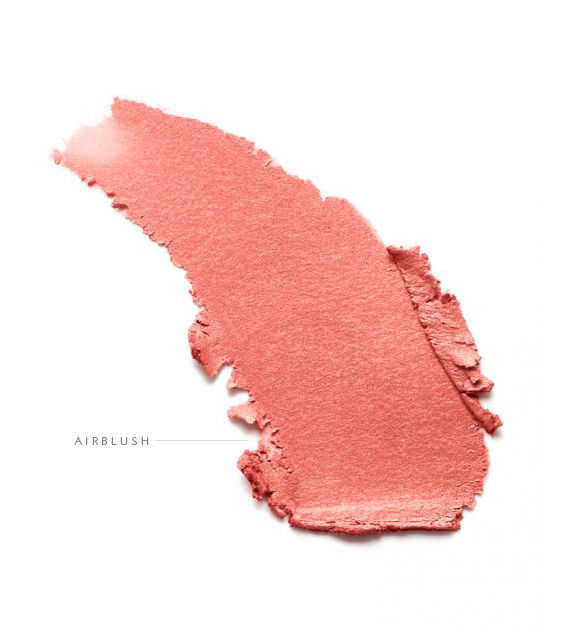 The color on my skin was a beautiful peachy hue, it blended perfectly and went on with a glide that I am not used to–airblush. There was no signs of where the blush was applied (sometimes with the stains if you don’t blend well it can cause a ‘halo’). I applied with my fingers, which I continue to do, it’s super light. It’s not like any blush I have tried before (and since I have been around since dinosaurs walked the earth, I think I have tried them all). I tried the Dream Bouncy Blush from Maybelline and a similar product from Sephora, but those dried to an almost powder-like consistency on my face and pilled, this Airblush is undetectable if you blend well (which is effortless to do). How long does it last? It lasted a good 8 hours on me which is excellent as my makeup tends to wear off fairly quickly (again due to my dry skin and yes, of course I prime, etc.) As for the shimmer? I am not crazy about it in any product, but it’s very, very fine so it is hardly noticeable (I don’t look like I am going to a rave or anything). I think it’s worth going down to Sephora or Ulta and trying the Tarte AirBlush out, I have used it with the BB cream too and it performed perfectly. I love it and I can’t wait to try the other colors! Miss Tristan B. is the proprietress of Besotted Brand and the writer of this delightful blog. She never leaves the house without sunscreen, lip balm, a ‘natural’ flush and a smile. She recently moved from the city to the country with her husband and two pups. This reminds me that I still need to try out the BB cream! Since using the Neutrogena lotion you recommended I’ve been playing with wearing virtually no make up at all (blush and mascara for work and play, though). It’s not that my skin is suddenly perfect (I still have the hyperpigmentation but I *think* it’s fading slowly) but it seems more glow-y. Not sure if that’s all in my head but it’s nice. Rachel a lot of people don’t like the Garnier BB Cream. You really need it to ‘settle’ before applying other cosmetics. I read that some people had problems with it coming off, but I think because my skin is so dry it stays on fine. I like it and it’s A LOT of product for the price!